The Warehouse Hotel picked up four accolades at this year’s AHEAD Asia Awards 2018, including the prestigious “The AHEAD Asia Hotel of the Year Award”. The honours, conferred by AHEAD (Awards for Hospitality Experience and Design) Asia, recognise exceptional hotel design and outstanding hospitality projects in the region and are entered, judged and attended by industry professionals from around the world. The other wins were for “Guestrooms”, “Lobby & Public Spaces” as well as “Urban Hotel – Conversion”. Situated along the infamous trade route that connected Asia and the Straits of Malacca, the building was once a hotbed of activity for secret societies, business deals and underground spirit distilling. Today, The Warehouse Hotel is a meticulously restored destination that has redefined the notion of ‘industrial design’ by incorporating elegance, focus and softness throughout. Designed by homegrown agency Asylum with architectural rehabilitation led by local firm Zarch Collaboratives, past and present are seamlessly integrated throughout the property, but especially so in the lobby bar and reception. 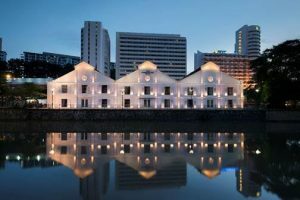 Exposed original brick walls add warmth to the space, while custom light features play off original trusses and tell the story of its past as a spice warehouse along the bustling Singapore River. Each of the spacious 37 rooms were designed to complement the building’s existing layout. No two rooms are exactly alike, and each exudes a sense of modern luxe with the use of copper, green forest marble and wood. Meticulous about every last detail, even the key in-room elements tell of a Singaporean story – minibar, artwork, bed throws and mugs are all by local makers. The Warehouse Hotel is the inaugural hotel of renowned Singaporean hospitality firm, The Lo & Behold Group. Opened in 2017, it is owned by I Hotel and is part of Design HotelsTM.